Fleur Schweigart studied prehistoric archaeology at the Freie Universität Berlin. 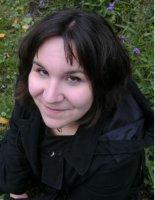 Since October 2014 she has been doctoral fellow in research group (A-6) Economic Space with a thesis entitled “Distributionssysteme kaiserzeitlicher Drehscheibenkeramik zwischen Elbe und Oder”. Fleur Schweigart has also participated in the PhD program “Landscape Archaeology and Architecture” (LAA) at the Berlin Graduate School of Ancient Studies (BerGSAS).